Jagga Jasoos 'revels in its lavish imagination, meddlesome inquiries and delicious Bongness, never once pausing to catch a breath or make sense,' says Sukanya Verma. Guns fall off the sky, giraffes skirt its ambitious frames and indigenous tribes of North East India and Africa season the scenes with flavours of whimsical diversity. Verse and action spurt out by the second in the wildly alive and mobile phones-free universe of Anurag Basu's Jagga Jasoos. Dispensing with the notions of realism, Basu sets up a frothy space around his adventure fantasy that revels in its lavish imagination, meddlesome inquiries and delicious Bongness, never once pausing to catch a breath or make sense. The musical format works delightfully for the brand of quirk Basu means to convey. The experience is akin to watching an animated musical where its charismatic, cartoonish leads (Ranbir Kapoor, Katrina Kaif and Saswata Chatterjee) and spectacular supporting cast (Saurabh Shukla and Rajatava Dutta) know exactly which buttons to press when and engage the audience into its colourful, chaotic journey. In the nearly three hours that glide by, Ranbir and Katrina waste no time to hoodwink cops, roll over roofs, gallop past shops called Stebe Jobs Cyber Cafe, raft into an underwater cave, fly a plane, ride ostriches, dodge rockets, catapult pumpkins, prance in traditional Russian costumes, puppet dance in open-aired Moroccan markets, discover the truth and myth about two-headed freaks, travel across the world and make it a better place. It's easy to see now why Jagga Jasoos took so much time in execution and, perhaps, an awful lot got left behind at the editing table. Govinda's no show and Sayani Gupta's blink and miss appearance certainly point out in that direction. From a viewer's point of view, I couldn't be bothered. Jagga' breezy, breakneck jasoosi kept me entertained through and through. My mind is still processing the afore-mentioned imagery's influx as I write this. 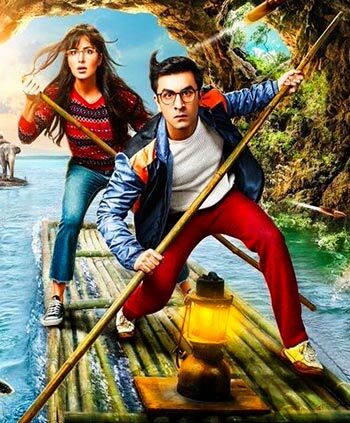 For all the crazy load of excitement it packs in though, Jagga Jasoos revolves around a one-liner premise -- of son looking for a missing father. But Basu is a master of nuance and tender sentimentality. An attribute that comes forth in the manner he bonds a shy, stammering Ranbir and ingenious Saswata over a brain-walnut analogy that acquires a giant heart as it progresses. There's nothing more rewarding than honest tears on screen and Basu never loses sight of them even amidst madcap shenanigans. Occasionally, the film feels over exaggerated and conscious of its richly designed quaintness. A few trippy ideas are bounced off but never fully explored; the final scene is a complete hoot though. In its defence, whatever unfolds before us are contents of a comic book read aloud by Katrina to a bunch of kids in the most cloying side-track of Jagga Jasoos. Stammer or sing, rap or rave, dance or dive, cry or crow, a bespectacled Ranbir's energetic quest for answers and zesty idealism is on par with Hogwart's most famous alumnus. The screen bursts with appreciation at his slightest gesture and spins in joy over his finest feat. His camaraderie around Katrina is unique. She's older, working and independent, he's just a uniform-clad, wannabe Sherlock who can smell a murder from a suicide. Katrina's comfort for action is well documented in Ek Tha Tiger but it's the winsome, easy air she displays in her sense of wonderment and playfulness in donning dungarees and doing kangaroo moves that made me wish to see more of her light side. Behind the scenes, Jagga Jasoos finds its rhythm in Basu's Utopian vision and humour that carries a not-so-subtle anti-weapons message but an understandably adolescent view of hate politics and global terrorism. S R Varman's rapturous frames give the film its distinctively fanciful appearance while the composer-lyricist team of Pritam, Amitabh Bhattacharya and Neelesh Mishra infuses the proceedings with irresistible spontaneity. Tintin, High School Musical, Hugo, Silver Streak, Blended, Satyajit Ray, Tim Burton, Wes Anderson make their presence felt in Basu's filmmaking instincts and visual inspiration. It's almost like he maybe cheekily admitting through the brilliant, brilliant Saswata -- every thief is an artist until caught -- to his Barfi! crimes. Jagga Jasoos isn't a particularly bright caper. It's about seeking nirmal anand whose playful ingenuity is held together by a bag of unending tricks that lend the trip wind in its wings and cheer in its will.